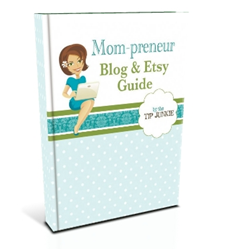 I am excited to announce that Apostrophy Designs got to be apart of Tip Junkie's Mom-preneur Blog & Etsy guide! A few of my thoughts about having and maintaining an etsy and a blog have been published alongside some other amazing mom-preneurs! When Laurie sent out this amazing book for us to proof read I was amazed at the knowledge and amazing experience some of the Mom-preneur's had to share. I say it's worth a definete read if you are looking to get into the etsy / blogging world. How cool Tori. You really do some amazing things! Congrats!